There are countless articles and books written on branding where people talk about branding as an activity or a specific job role. Unfortunately, most of them are misguided simply for the fact that you do not own or control your brand as it is defined by the internal feelings your employees, suppliers, customers and their associates have when they think of or experience your brand. Since you cannot control their feelings, you just cannot claim to fully control your brand. However, you can actively influence and shape their feelings – striving for an alignment between your desired image and their actual feelings. A lot of people toss around the term authentic branding but there’s not enough visibility around what constitutes it or how to build an authentic brand. Authenticity is a feeling that impels you to trust a particular person, product or a brand. The word Authentic is defined as being true to one’s own personality, spirit, or character. An international survey in 2014 by Cohn & Wolfe found that 87% of global consumers felt that it was important for brands to “act with integrity at all times,” ranking authenticity above innovation (72%) and product uniqueness (71%) when asked what they valued most in a brand. We tend to equate authenticity with honesty. So, do you have to be completely honest to be authentic? After all, we are multifaceted beings with various aspects and facets. A truly honest personal brand, for example, would have to include the cranky pre-coffee version of you right alongside the polished-and-fabulous you. Do you really have to show off your not-so-good side to be honest or authentic? The answer is No. Building authenticity comes from focusing on what you do best, and then inhabiting and communicating that in every aspect of what you do. 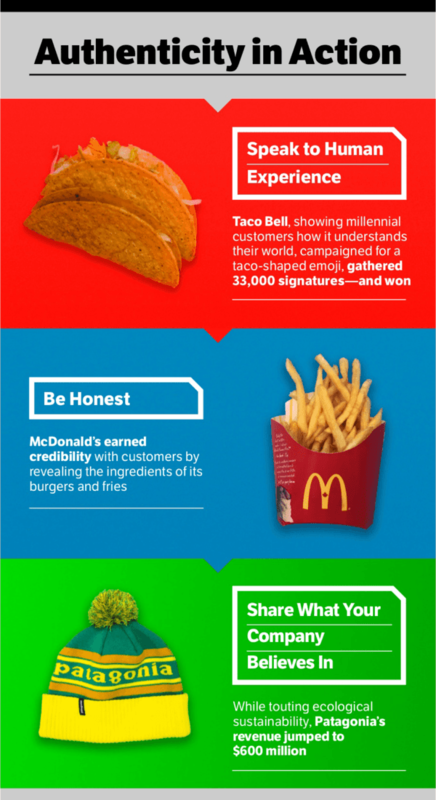 McDonald’s earned credibility with customers by revealing the ingredients of its burgers and fries. Ditch authenticity as a brand attribute. Don’t say you are authentic — be authentic. “Straight-talking” and “plugged-in” are both better word choices to personify your brand. Attributes should be sufficiently nuanced to drive differentiation through creative expression in a way that will foster a real audience connection. Before the advent of the digital age, brands controlled all levels of communication, making it hard for end users to make informed purchases. But today, with social media and consumers’ increasing dependency on online communication, brands no longer control the entire communication flow. Instead, they share their message on a global platform and potential customers decide its success, thereof. In a time of declining trust, maintaining credibility is essential for holding on to the ability to persuade. For brands, this means being loyal to internal ideas about their purpose, vision and strategy versus chasing the trends that seem to shift daily. Vision Critical found out that half of Americans tust small firms to do the right thing but only 36% trust large firms to do the same. In Trust Agents, Chris Brogan and Julien Smith offer six rules for becoming more authentic, and more worthy of trust – from the day to day interactions with colleagues, to the armies of friends, followers and fans of brands. Use them to build your brand’s authenticity. Make your Own Game: Use a synthesis of what is out there to find creative uses for tools that exist, or invent new tools to solve problems and create opportunity. What a brand does today, may be tomorrow’s cost-of-entry. It’s the best way to stay ahead of the curve. While technology offers brands a blank canvas, putting human value ahead of shiny new objects will make the best impact. Be ‘One of Us’: People want to belong and fit in. We often use the word ‘tribe’ to describe this, which is no surprise. When brands can bring forward the human qualities beyond their products and services, they may be shown to be more relatable, and ‘one of us’. And because we like people who are like ourselves, we tend to believe what you say more. Remember the Archimedes Effect: Leverage means you “never have to reinvent the wheel” Think more about the opportunities (and opportunity cost) versus who’s got the advantage. Since both sides of a lever have the same power, it’s all about optimizing the focal point. Go for Agent Zero: Connecting is the name of the game, and there’s great opportunity for brands to get even more personal and meaningful. Programmatic, marketing automation, and account-based marketing help to lay foundations for connecting potential, but understanding how to meet your customer needs and the relationship they want to have is critical in using these tools. Become A Human Artist: Etiquette and human understanding are the cornerstones of any meaningful life. Like people, if a brand is to have trust, it must have respect, and understand how to interact with people. Whether face to face, or engaging on Twitter, always remember that people are people, and expect that they want to be treated that way. Build An Army: To be a leader, you must be able to call resources to your command. Help grow your army by helping your team build skills and share their experience. There are millions of people out there with unique points of view that may challenge assumptions or offer a key ingredient overlooked in marketing strategy. Prove-able: Can you substantiate the claim? This should be obvious, but it’s remarkable how many brands claim to be the market leader or the most advanced or the key influencer when in fact they are nothing of the sort. Their claims are hope or fantasy – and the proof that they are exaggerating comes in the plethora of small print that accompanies the statements or in the use of qualifying language. It’s disingenuous, for example, to say that over 90% of people think something when your sample size is tiny or to imply that drinking or doing something is going to achieve significant changes to weight or health when the get-out-of-jail disclaimer “Results may vary” is being used in such a way as to really mean ‘You haven’t got a hope in hell of achieving anything like this”. Interesting: If you’re going to tell consumers something about your brand, tell them something they will be interested in. I’m always surprised at how many brands disappear down a rabbit-hole of self-indulgence or self-justification when it comes to thinking why people will find their stuff fascinating. Rule of thumb – your brand is almost never as exciting to buyers as it is to you. If you’re struggling to make your brand seem interesting, here’s a suggestion. It’s probably not. And the only people who can change that are you. Getting the ad agency to find a way to repaint that particular elephant in the room may prove their artistic and creative skills but can only do damage to the trustworthiness of the brand as a whole. Symmetrical: A great paper by Suzanne Shu and Kurt Carlson argues that three has a symmetry that marketers would do well to follow. Three sequential claims make sense, for example, while three viewings of an ad is the sweet spot between awareness and boredom. Jamming your marketing with claims in the hope that some will stick simply confuses everyone. Playing the same message endlessly has people reaching for the remote. Real: In the bid to substantiate difference, brands love to wheel out awards as credentials. I’ve lost count of the number of award-winning cars I’ve seen for example. It almost feels like everyone has won something. The thing is, stating what you’ve won is meaningless, literally, if it doesn’t mean anything to the people you are marketing to. When everyone is “X of the Year”, no-one is. Unless you have a credential that displays acknowledged distinction, the epaulets you are pinning all over your campaign are little more than wallpaper. They are as reassuring as everyone else’s reassurances. The Royal Jordanian simply got a brand makeover by trolling Trump. The airlines has also been praised for amusing ads on French election. Brand authenticity starts by understanding the feelings people have when they think or talk about you. A strong brand is built through the consistently positive conversations of employees, suppliers and customers. Every call to customer service, every produce mentioned in conversation, every order placed, every outbound sales call, every business card handed out, every invoice sent – there are conversations happening around your right now and yet most companies turn a deaf ear. Rarely does a Brand Manager focus on participating in those conversations when it comes to branding. They typically look at promotions, advertising, logos, packaging and taglines. These are important elements of your overall marketing activities. But to name that “branding” and call it a day is shortsighted. If you continue to stifle conversation between employees, suppliers and customers, you are not building a brand. Marketing is a conversation. Today, it’s all we hear. We must be prepared to have a dialogue with the audience. And that scares many brand marketers today, because they have spend the last couple of decades speaking at their target audience, not with them. So, how do you create a real conversation in a place that’s really not set-up for conversation? Just follow two simple keys to have a great brand conversation. The first is in the fact that the best conversations are authentic. They’re chats. They don’t carry pretenses. They’re not sales pitches. Think about how many times you talk about a new restaurant, a new business connection or a bad customer service experience. As humans, we love to chat. We love to talk about the good things and bad things – especially the bad things – that we encounter. And we love to talk honestly. The second is in screening on whether the rules for handling the business is set-up for your convenience or the customers? If, after checking into a Hilton, you are told that they no longer have food service because ‘it isn’t convenient to them’, then you can’t really have a conversation with someone whose rules are set-up to ignore your needs. The real challenge for brands today is that we’ve got lots of brands we can talk to. So if we are not enjoying the conversation we are having with you, it is really easy for us to find someone else to talk to. If I am going to put the effort in talking to you, have the courtesy to engage me back. If it’s an authentic, relevant and compelling conversation, who knows how long I’ll stay with you! “The meaning of your story will change depending on the culture of the times and the mindset of the audience you’re appealing to”, explains Bob Cook, director of innovation at Firefish, the agency that revealed in Marketing Week which brands are perceived as authentic by different customer groups. Embrace content marketing as a core communications strategy. The value in having real people advocate for brands by inspiring, informing and entertaining audiences across social, content and video is real. The key to authenticity with paid creators it to find the ones whose mission is truly objective. Your brand must truly reflect the feeling and beliefs of the curator or creator. You want people who would not produce content for your brand if they did not believe in it, regardless of the paycheck. If you don’t have this, find someone else. Expand your brand’s comfort zone. Encourage, don’t dictate, social conversations and personal stories and videos. Don’t sell your product — stand it up and let it run. Let everyday people, professional creators and experts communicate their love or need for your brand in their words and style. Be willing to be criticized or attacked. There’s real value in finding out things you may or may not want to hear. As marketers embark on future product launches, understanding emerging consumer dynamics and just getting through each week, we should create programs and processes that help fulfill the dreams and desires of our audiences in ways that are natural and organic to them. This is the root of brand authenticity. Let’s stop saying we’re authentic, let’s just be authentic and keep it real — and those evasive millennials will be more open when your brand comes knocking on the door. How would you ‘brand’ differently if you started thinking of your customers as friends and relatives rather than targets? What would you say differently? What new products or services would you offer if you only serviced friends and family? How would you reduce the risk of choosing you? How would you serve them differently? How much happier would they be with your new offerings versus your current offerings? Those are the questions of authenticity based branding. They create authentic interactions and conversations.